Once again this year, one of the most prominent contingents of filmmakers and films at the Bangkok International Film Festival comes from the Philippines. For a look at where these indie filmmakers are coming from, Lekha J. Shankar went to the Cinemalaya festival in July in Manila, where she had a firsthand look at the Filipino independent cinema scene. No Asian country is as much in the news for its cinema today as the Philippines. Their new indie cinema is creating waves at the top festivals of the world, and a kind of climax was reached when Filipino director Brilliante Mendoza won the Best Director Award for Kinatay at the Cannes Film Festival this year. In fact, there were as many as three films from the country in Cannes this year. All of them and more will be seen at the Bangkok International Film Festival, with Mendoza himself being on the main jury. “I’m excited to come to Bangkok, especially as I won an award there last year,” Mendoza told me at the Cinemalaya festival in July in Manila. The director was referring to the top Golden Kinaree award which he won for Serbis at BKKIFF last year. Serbis had premiered in the Palme d'Or competition at Cannes last year too. The dynamic director has quickly followed up Kinatay with yet another feature, Lola, which was a surprise entry to the Venice Film Festival earlier this month. Filipino independent cinema seems to be on a roll. So why is a country noted for its scenic islands suddenly becoming noticed for its smart cinema? Answers were to be found at the Cinemalaya independent film festival in Manila. There’s much Thailand can learn from this festival, which would give a big boost to the Kingdom’s sizable indie talent. Speaking of their talent-hunt, artistic director Nestor Jardin explained that the Cinemalaya Foundation holds script "tests" every year, in which participants are asked to write two-page treatments of their film stories. Once the best scripts are selected, the Foundation helps the writers to get started on their projects, with basic funding of about 500,000 pesos (US$10,500). The filmmakers are also introduced to potential producers. Jardin says thanks to the digital format, the filmmakers can bring the work in on the modest budget. That’s one reason why the country produces so many indie films. The Cinemalaya Foundation also helps the makers to market and distribute the films internationally. According to Jardin, the Cinemalaya festival has a competition section for the 10 best features and 10 best shorts from among projects made from the script contest. 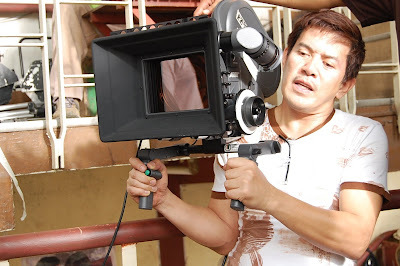 Other Cinemalaya projects films are shown outside the competition. With ticket rates as low as 100 pesos, they had as many as 30,000 people at their festival this year. Can the Bangkok International Film Festival boast of such figures? Jardin said Cinemalaya awarded cash grants to the award-winning directors , which would help the latter to improve the technical quality of their films, and possibly partake in the international festival circuit. That’s probably why the new Filipino cinema is creating waves at the top festivals of the world. To quote a Screen International article, “The local film industry in the Philippines is showing an upward trajectory that has defied expectations." This year’s Cinemalaya had programmers shopping for films to take back to Cannes, Pusan, Hawaii, India, Sri Lanka, Malaysia and Singapore. Jardin spoke of young director Francis Xavier Pasion, whose film Jay won many awards at the Cinemalaya last year and went on to create waves at top festivals like Venice and Pusan. Jay also won a Special Jury Award at the BKKIFF last year. Kinatay, by Mendoza. Winner of the Best Director Award at Cannes, it's showing in the non-competition Southeast Asian Panorama. It's the story of a young man who unwillingly takes part in the killing and dismemberment of a prostitute. Aurora, by Adolfo B. Alix Jr., about a social worker kidnapped by guerrilla fighters, makes its world premiere. Imburnal, by Sherad Anthony Sanchez. This 215-minute view of adolescents growing up in a sewer premiered at the Cinemanila International Film Festival last autumn, winning the festival's Lino Brocka Award. It swept the awards at this year's Jeonju International Film Festival in South Korea, taking the Grand Prize, the Woosuk Award and the NETPAC Award. It's in the Southeast Asian Competition. Independencia by Raya Martin, also in Southeast Asian Competition. This story of a family living in the jungles during the American occupation of the Philippines, premiered in the Un Certain Regard program at Cannes. Manila, two short films by young directors Alix and Martin, who pay tribute to their forebears, directors Lino Brocka and Ishmael Burnal. It premiered in a special screening at Cannes this year. It's in the Southeast Asian Panorama. 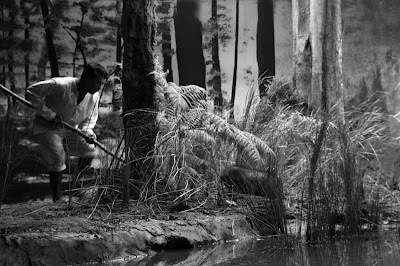 Butterflies Have No Memories, the long-haired Filipino indie godfather Lav Diaz has a short film, as part of Visitors, this year's Jeonju Digital Project by the Jeonju International Film Festival. Last month in Bangkok, Diaz had a retrospective, and he was here to show a rough cut one of his in-progress works. As an aside about Independencia, it was among the films pitched at the 2nd Produire au Sud Bangkok script workshop at the 4th World Film Festival of Bangkok. The 7th World Film Festival of Bangkok, to be held from November 6 to 15, will likely boast strong Filipino films too. Also, the Philippines has another film-financing scheme and festival, the Cinema One Originals, which also commissions low-budget digital works for screening at its festival and broadcast on TV. Clearly, from looking at what's happening in the Philippines, it's time that Thailand's film and culture establishments woke up and got started on a long-term plan to tap the latent film talent in the Kingdom. The annual Thai Short Film and Video Festival is proof of the huge pool of indie talent in the country. It’s about time this talent is tapped, discovered, supported and promoted.